Two-piece chromed metal belt buckle, the left section attached to a circular plate with a central horizontal slot. The plate is inscribed around the edge 'AIR DEFENCE CADET CORPS'. The right section is attached to a smaller slightly domed circular plate embossed with a stylized bird motif. The two sections interlock to form the buckle. It shows light use and wear but in excellent condition. The Air Defence Cadet Corps was formed in 1938 with the objective of encouraging interest in pre-service aviation training. The intention was to ensure there would be some combat ready pilots should war break out. Squadrons were set up in as many towns around the UK as possible aimed to prepare cadets for joining the RAF or the Fleet Air Arm. Before the end of 1940 the British goverment recognised the value of the cadet force and took control, renaming it as the Air Training Corps. 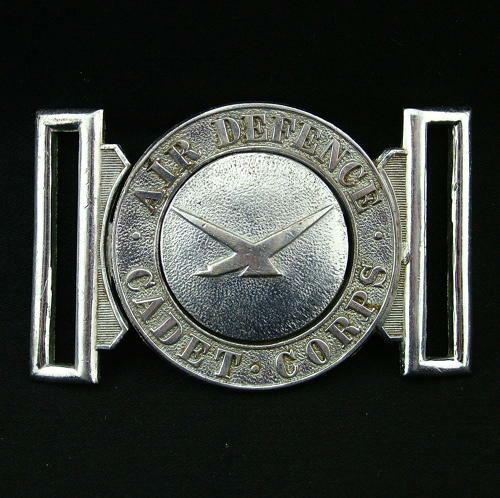 The Air Defence Corps was in existence for less than three years so any uniform items are scarce and sought after. Stock code U22634.